A super grid is a wide area transmission network that makes it possible to trade high volumes of electricity across great distances. The Super Grid is highly coordinated from a macro level spanning nations and continents, all the way down to the micro level scheduling low priority loads like water heater and refrigeration. In the European SuperSmart Grid proposal and the US Unified Smart Grid concept, such super grids have intelligence features in the wide area transmission layer which integrate the local smart grids into a single wide area super grid. This is similar to how the internet bound together small networks into single ubiquitous network. 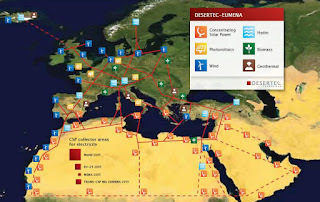 DESERTEC's conceptual plan of a super grid linking renewable sources across North Africa, the Middle East and Europe. Wide area synchronous grids in Europe. Unified National Smart Grid - A proposal for a United States wide area grid that is a national interconnected network relying on a high capacity backbone of electric power transmission lines linking all the nation's local electrical networks that have been upgraded to smart grids. Wide Area Synchronous Grid (aka Interconnection) - A power grid at a regional scale or greater that operates at a synchronized frequency and is electrically tied together during normal system conditions. VFT - Variable Frequency Transformer- Used to transmit electricity between two asynchronous alternating current domains. The VFT is a relatively recent development (first deployed in 2004). Most grid interties use high-voltage direct current converters. A super grid is a possible solution is to utilize the enormous potential for solar and wind power in the world’s deserts and move the power to temperate load centers. For example, renewable electricity from North Africa would be sufficient to satisfy the electricity needs of the Mediterranean and the rest of Europe many times over. However, the electricity would have to be transported over vast distances from North Africa to European load centers. Due to high transmission losses, long-distance transport is not feasible with the current AC system, even if the interconnection capacities were sufficient, which they are not. HVDC technology to transport electricity efficiently over vast distances has been available for decades. 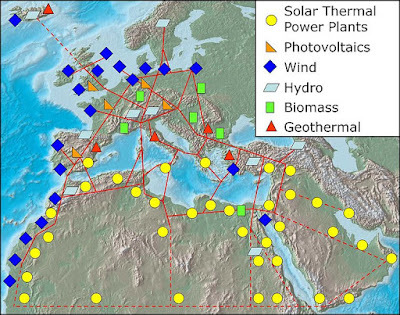 European electricity market could be integrated in an HVDC grid, known in Europe as a SuperSmartGrid (SSG), and connected to neighboring regions, such as North Africa, and their vast renewable energy resources. The SSG would operate “on top” of the current HVAC grid—only handling long-distance transmission—and existing AC grids would still distribute electricity over shorter domestic distances. As an engineering matter, putting PV in North Africa and bring the power to Europe over efficient high-voltage DC lines is quite feasible — not very different in scale from piping in gas across continents and beneath seas, as is already done. A series of detailed modeling studies by Dr. Gregor Czisch, which looked at the European wide adoption of renewable energy and interlinking power grids using HVDC cables, indicates that the entire European power usage could come from renewables, with 70% total energy from wind at the same sort of costs or lower than at present. 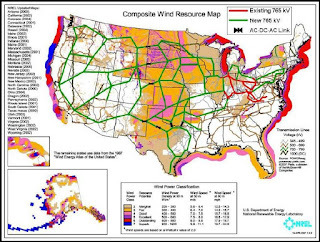 US Wind Integration - A new grid system could carry electricity from the wind-rich Midwest to New York, Washington DC, Atlanta, and other eastern cities. Offshore Wind Integration - Longer term, wind turbines off the Atlantic coast could generate wind energy that would flow in the other direction, from east to west. Improved Load Balancing of Intermittent Power Sources - One advantage of such a geographically dispersed and dynamically balanced system is that the need for base load generation is significantly reduced since intermittency of some sources such as ocean, solar and wind can be smoothed. Opens Up Markets - In the same way that freeways revolutionized interstate transport and the internet revolutionized online commerce when comprehensive high capacity networks for them were built, it is argued that a high capacity super grid will provide a distribution network so comprehensive and with such available capacity that energy trading is only limited by how much electricity that entrepreneurs can bring to market. Political Risk – Those fretful about buying power from Russia or the more unsavory Gulf oil producers might be equally unhappy to buy it from Libya or Algeria. Implementation of DESERTEC would require cooperation between the states of Europe and the states of the Middle East and North Africa. The European importation of electricity from the Middle East and North Africa could entail political risks if the proportion of total energy supply exceeded a certain level. This is especially because the sites might be vulnerable from terrorism (although it would be spread over different sites, with around 20 power cables transmitting) and there are no military forces defined to protect it. Long Planning Horizon - it takes a very long time to get the appropriate authorizations ( 7 to 10 years ) to build new transmission lines, longer than the time required to build new power plants ( 3 – 4 years for wind farms or combined cycle gas turbines – CCGT ) Most of the transmission investments will not be driven by demand, in other words not driven by higher volumes of transmitted electricity; consequently the unit cost of transmitted electricity will increase. This tariff impact needs public and political acceptance before such investments will take place. Cost - Transmitting energy long distances has been criticized, with questions raised over the cost of cabling compared to energy generation, and electricity losses. Investment may also be required within Europe in a ‘Supergrid’. In response one proposal is to cascade power between neighboring states so that states draw on the power generation of neighboring states rather than from desert sites. Financing - Venture capital is currently unlikely to be interested given cheap oil and gas prices make the proposals more costly than fossil fuel alternatives. One key question will be the cultural aspect, as Middle Eastern and African nations may need assurance that they will own the project rather than it being imposed from Europe. Market Silos - There is a need for a single market in electricity throughout the EUMENA region so that, for example, any customer in Germany or the UK may buy electricity directly from any supplier in North Africa or the Middle East. With some modest upgrading of the existing grid to remove bottlenecks, the trading of electricity throughout EUMENA may begin quite soon. As volumes increase, transmission capacities may be increased by converting HVAC lines to HVDC, by building new HVDC lines, and by the installation of smart electronics. Desertex Foundation - The mission of DESERTEC Foundation is the fast global implementation of the DESERTEC Concept. Desertec Project - a sound alternative to Russian gas pipelines? GCC Grid - Gulf Cooperation Council Interconnection Authority (GCCIA) - A joint stock company subscribed by the six (6) Gulf States. Saudi Arabia will be able to give and receive 1,200 megawatts, the UAE 900 megawatts and Qatar 750 megawatts. 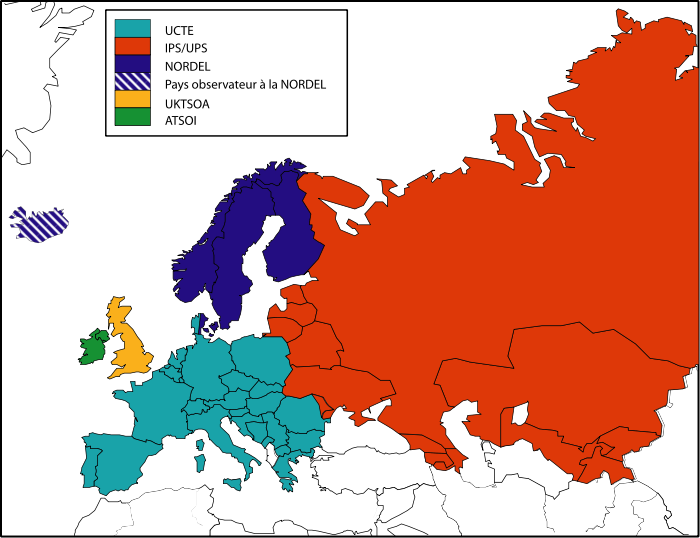 Nations are now negotiating to sell power to each other starting from next year. By facilitating sharing, the huge grid project will reduce electricity costs by making it possible to share the lowest cost generation on the grid. 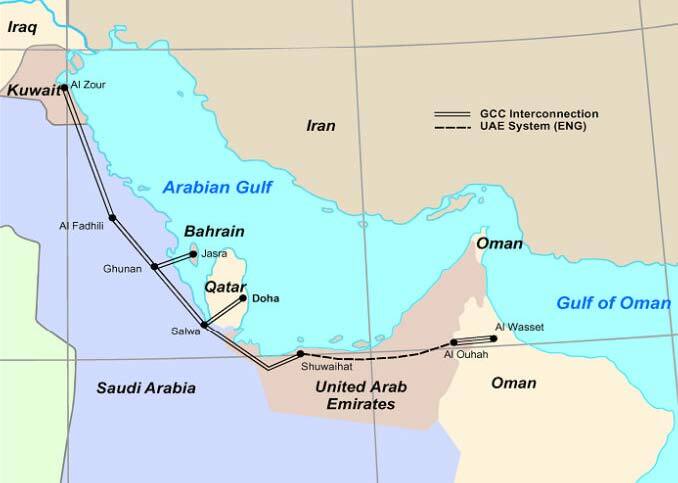 Phase two of the long-planned GCC Grid was inaugurated in May 2011. When all four sections are complete it will unite the six Gulf nations on one unified electric grid, making it much easier to build and share power from renewable energy sources, and realize the gains in energy efficiency that come from sharing a wider grid. The cost savings could amount to Dh$18.4b – in US dollars, about $5 billion. An analysis by Richard Tabor at Charles River Associates found a compelling economic case for the huge interconnected grid that, once complete, will link the power systems of the six Gulf countries. But the economic benefits are skewed. Saudi Arabia and Oman would be the clear winners, and Kuwait and Bahrain would come out even, while Qatar and the UAE might be negatively affected with higher energy costs. 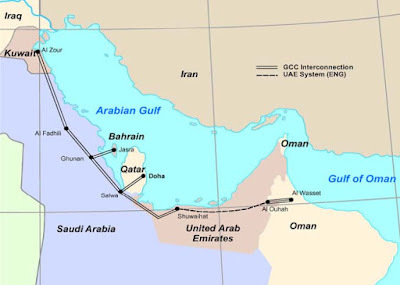 The GCC Interconnection Project will connect the grids of the six Gulf states with both overhead electric lines and an underwater cable in the Arabian Gulf, at a cost of more than $1.4 billion. It will make it possible to create a common energy market and help grow sustainable energy supplies from solar projects and wind farms. Super Smart Grid - The SuperSmart Grid project is a collaborative effort between a number of individuals who divide their time between the European Climate Forum and the Potsdam Institute for Climate Impact Research. Study TRANS-CSP on an Intercontinental Transfer of Solar Energy – A DLR Study for the BMU 2006 . 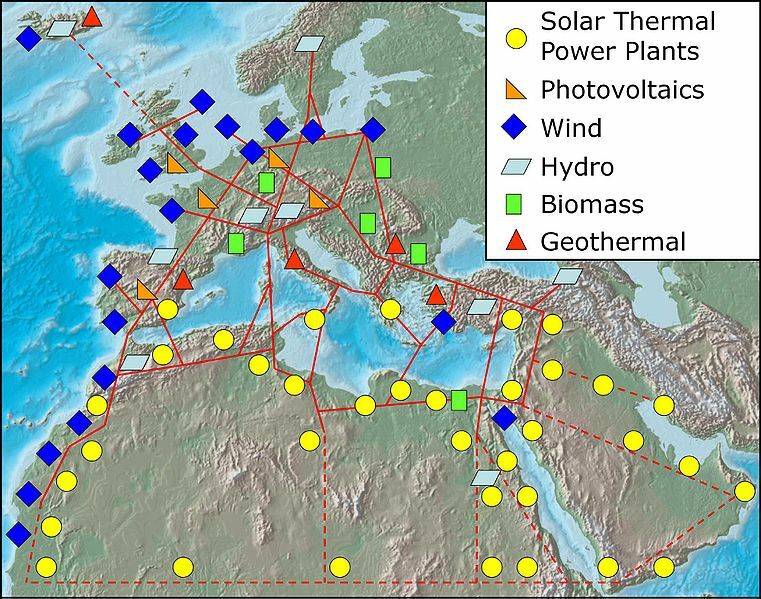 The TRANS-CSP study focuses on the interconnection of the electricity grid of Europe, the Middle East and North Africa (EUMENA) with the purpose of supplying about 15% of the European electricity demand by solar energy imports from the South by the year 2050.